Our wonderful doctors at Primarys did some tests to figure out the cause of the seizures. When Nadezhda was about 1½ years old we finally had a working diagnosis of Alternating Hemiplegia of Childhood. This could only be truly diagnosed by the process of elimination, which turned life into a waiting game. 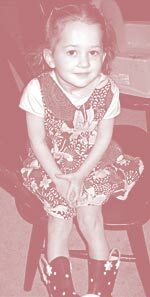 When she was just over 2 years old we moved to Kentucky and took her into the neurologists at the University of Kentucky. Our first doctors were great and willing to do many tests but wanted to start over to be sure no simple explanation for the seizures was missed. However, we got a call from Nadezhda's previous neurologist. She told us that she had just attended an epilepsy conference in Ohio and she learned about a disease called Dravet Syndrome that she thought fit Nadezhda's symptoms very closely. She told us that if Nadezhda was still her patient she would pursue this diagnosis and suggested we ask our doctor to do the genetic test to find if this was her disease. So we did ask our new neurologists to perform this test but they didn't think it was likely to be Dravet Syndrome and that it didn't fit her symptoms well enough to pursue, so they opted to start from the beginning and redo many test. Curtis, Nadezhda's dad, was not willing to take this extra time and the step back to look at all the same tests again. He asked again with the same response. Somehow after our second appointment we got switched to a new neurologist, Dr. Khan. At our first appointment with Dr. Khan, Curtis asked if he would do the test on Nadezhda to see if she had Dravet Syndrome. He thought for a moment and agreed that her symptoms were enough like Dravet Syndrome symptoms that it was worth doing the test. He made the appointment and we got the test done. Just over 2 weeks later we got a call from Dr. Khan, telling us that her test was positive for Dravet Syndrome. We had another appointment with Dr. Khan where he explained Dravet Syndrome to us. He also told us that he had had 7 other Dravet Syndrome patients up north where he previously worked. He put Nadezhda on Depakote, which proved to be helpful. But soon after we added Clobazam, a med from Canada, which was also very helpful. She has also tried Topamax and Keppra but has been weaned off both these. We are starting to wean her off of the Phenobarbital now. It will take several months to finish with the Phenobarbital but we think it will be beneficial for her. Now, rather than 30 minute seizures to 1 hour 45 minute seizures, she has 1 - 3 minute seizures. She still has all types of seizures but they are much shorter and still only occur a few times each month. This is a great improvement obviously. She continues to progress physically and mentally although progression is slow. She has never digressed, thankfully, and we pray that her progression continues. Submitted 20 February 2011 (by Gail Benson). Read more about Nadezhda on their blog: Our Family: Us, Dezh, and Dravet Syndrome .